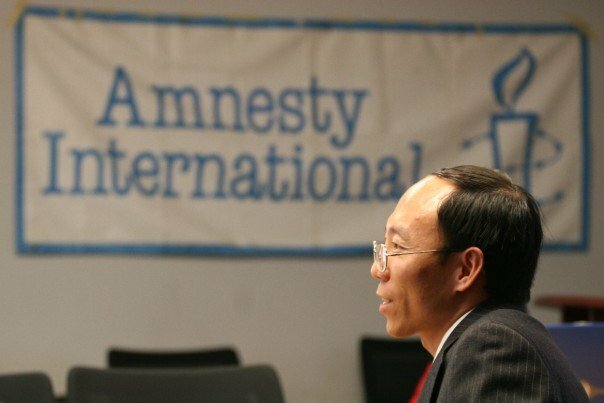 With Canadian Prime Minister Justin Trudeau currently visiting China on a trade mission that aims to deepen ties with the communist country, a former Amnesty International prisoner of conscience is speaking out about a sinister plan the Chinese regime has up its sleeve. Toronto resident He Lizhi is now safe in Canada, but in March 2000, while still in China, he was abducted by police due to his spiritual beliefs and later, during house arrest, was made to watch a highly confidential internal Communist Party video that aimed to “transform” him. The video revealed the Chinese Communist Party’s (CCP) plan for religious believers around the world that totally shocked He. The video was of a talk given by Ye Xiaowen, head of the State Administration for Religious Affairs (SARA), to Party heads and officials within the state council’s different ministries. The talk took place a few months after then-CCP head Jiang Zemin launched a persecution of the traditional spiritual discipline Falun Gong, also called Falun Dafa, but encountered resistance from high-ranking Party officials—many of whom practised the discipline themselves at the time. The SARA chief was deployed to give a “theoretical lecture” to top officials to convince them that the eradication of Falun Gong was what the Party needed to do in order to achieve its ultimate goal: the obliteration of religion, not only in China but worldwide, and the elimination of the concept of God from people’s minds. In the video, Ye explained that the reason the Chinese regime still had religious freedom in its constitution was to use it as a “deceptive” temporary tactic, so as not to overly alienate the many minorities in China who believe in various faiths and also occupy large portions of the country’s landmass, He recalled. “Even though in the brainwashing environment of China we were taught to believe that communism is good because it promises you will have everything you want, I didn’t realize that the Party was planning to eventually eliminate religious belief, and people would not have the spiritual concept of God, and divinity would be eradicated from people’s mind,” He said. He’s superiors at his workplace—he was an award-winning civil engineer in Beijing—wanted him to watch the video because they hoped it would convince him to quit his practice of Falun Gong and be “rescued” from the CCP’s persecution campaign, which could well destroy his career, his family, and his future. Soon after the CCP launched its campaign of persecution of Falun Gong in July 1999, a special Gestapo-like office was set up to arrest, detain, and incarcerate in labor camps hundreds of thousands of adherents. Many died under torture, many had their careers and families destroyed, and, as investigations years later by human rights activists revealed, many became victims of a state-sponsored forced organ transplant system that has filled the pockets of the officials involved with billions of dollars. A report released last year by Canadian and American researchers found that this mass murder for organs—with an estimated 60,000 to 100,000 forced transplants conducted each year since 2000—is directed by the CCP and carried out by the military, state institutions, hospitals, and transplant professionals. It became a serious mission for He and other adherents to try to counteract the propaganda directed at the practice they had so benefited from, whose guiding principles are truthfulness, compassion, and tolerance. So every chance He got, he began telling acquaintances or even strangers about the peacefulness of Falun Dafa and the state’s lies. After appealing for Falun Gong in March 2000, He and his wife were abducted by police and detained, and He endured 3.5 years of incarceration because of his beliefs. He was eventually released from prison thanks to an international human rights campaign. But many prisoners of conscience are not so fortunate; there are hundreds of thousands of He’s fellow Falun Gong practitioners who are still imprisoned in China, and even face being killed for their organs. Calling the CCP “a wolf in sheep’s clothing,” He said he hopes the world’s democratic governments—including Canada, which may pursue a free trade deal with Beijing—will not be hoodwinked by the public façade put forward by the regime. He added that he worries that with China gaining so much influence internationally in recent years, the regime may one day be able to realize its wish of wiping out religious belief worldwide. “That would be a terrible thing, as people need to have the freedom to have their faith, their beliefs,” he said.